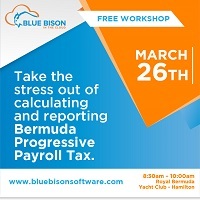 Blue Bison, the software division of Paragon GRC Bermuda, is officially launching their HRM/payroll software solution that has been modified to support the calculation and reporting of Bermuda’s progressive payroll tax regime. “Blue Bison is currently used to administer local offshore payroll and work permit processing by more than 7,000 employees each month in Cayman, Bahamas, BVI, and other regional locations,” the company said. “Customers include banks, audit and legal firms, hotels, wholesalers, retailers, government departments, schools, and hospitals. At an average cost of $7.00 per employee per month with an ability to integrate with the popular accounting, time tracking, and Global HRIS systems, Blue Bison is fast becoming the de-facto regional standard for easy payroll administration. CEO Graham Pearson commented, “Since the implementation of progressive payroll tax in Bermuda it has been a real administrative challenge for both small and large organizations – it’s quite a complex calculation and the traditional accounting packages such as Quickbooks, Sage, and others are unable to process and provide the reporting without significant manual intervention – this is where our customization of the Blue Bison software has provided a much needed affordable solution”. The company noted, “Blue Bison in Bermuda already has over 800 employees being administered since the soft launch last year. Included is support for the new HSBC and Butterfield Bank automated clearing house standard as well as support for the local major pension and health provider reporting formats. For those organizations that need to administer work permits, the Blue Bison HRM system also automates much of that process.